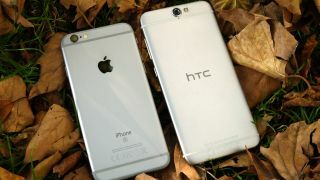 The new HTC One A9 smartphone showed its face to the world earlier this week, and many, including techradar, couldn't help but notice that face looked awfully similar to an iPhone. Now, HTC is firing back at the copycat comments: an executive on Wednesday said that the tables should be turned when it comes to design rip-off accusations. "We're not copying," said Jack Tong, president of HTC North Asia, according to Want ChinaTimes. "We made a uni-body metal-clad phone in 2013. It's Apple that copies us in terms of the antenna design on the back." In our hands on review of the HTC One A9, we found it easier to highlight what's different between the two phones rather than list out the similarities. We pondered whether litigation-prone Apple wouldn't find enough to take HTC to court over (it wouldn't have to look too hard). We also noted, however, that 2012's HTC One S featured a ceramic-like surface, one Apple didn't introduce until the iPhone 6 much later. In his comments, Tong was referring to the HTC One M7, a 2013 phone that not only features the two lines going across a single-colored back piece but also brought forth a new way to orient the antenna on a metal-clad phone. Tong reinforced his point: "The A9 is made thinner and more lightweight than our previous metal-clad phones. This is a change and evolution, and we're not copying." We'll have to see whether Apple agrees, and whether consumers will choose to buy an Android 6.0 device that looks like an iPhone rather than heading straight for the iPhone.